One of the primary reasons using Outlook Categories is faster than using lots of topic-named folders is that you can auto-categorize incoming mail very easily using Outlook Rules. These menu-created rules automatically assign categories to incoming e-mail based on sender or subject line or keyword in the e-mail, and so save a huge amount of filing time. If you’ve use Outlook Rules before to auto-file into topic named folders, you’ll find using them with categories is much better. Why? Because the mail is delivered to your Inbox after it’s categorized. That way you can still read and act on the mail. In contrast, the problem with using rules to auto-file into folders is the mail goes directly to the folder and you don’t see it. As a result, you are unlikely to set up rules for use with business critical mail—which is most of your mail! You’ll probably only use auto-folder-rules for newsletters and other low-priority mail, and so you are missing a major time-saving opportunity. After auto-applying categories with category rules (and acting as needed on that mail in the Inbox) all you need to do at the end of the day is drag all that mail into your single Processed Mail folder in one step. It’s so much faster than manually filing (and much safer than auto-filing into folders)! To learn how to use Outlook Rules with categories, scroll down to video #23 at this link. That video happens to be a free one (others on that page are part of the paid lessons). Please email free video as offerred. Hi Michael, great article. This is actually exactly the method I’m using to process and organize my mails. One thing that really annoyed me with these type of rules is having to continuously edit them and adding different email addresses to different categories. So I came up with an idea which is to create distribution lists containing contacts for each of these category rules, that way all I have to do is move the contacts to the appropriate DLs. However, when I tried to do that, Outlook failed to add the rule complaining that it is not supported. It only allows to add specific emails one by one. Do you have any suggestion? I have the answer. You can separate those contacts to different Address Books and then create rules that work on the address book rather than specific contact/DL. A good idea is to name the Address Book according to the category you want to assign to messages. This is a helpful tool, but I’ve run into a limitation—I’m only able to apply one category to a message. If I want to apply multiple, I have to create separate rules. Does anybody know of a way to apply multiple categories using a single rule? I don’t see the problem you’re describing. 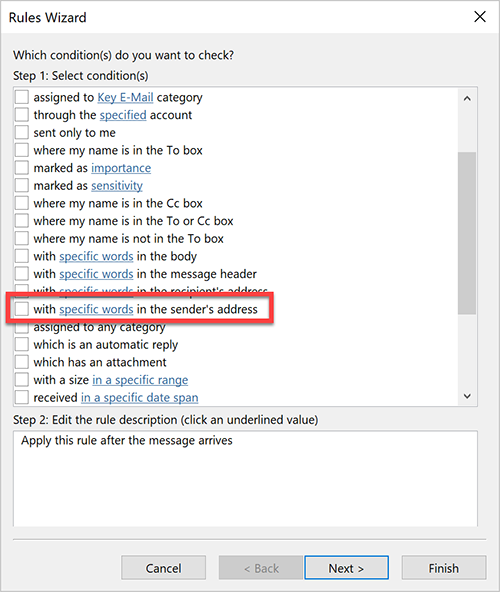 In the rule creation, it allows me to select more than one category..
Is there a way to set a rule based on the email domain that the email is sent from? eg. from a particular company so that all emails from acmeproducts.com could be put in the same category? This works great so far, thanks! What about outgoing email. 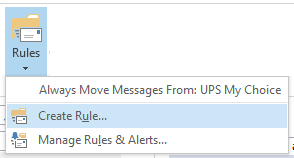 say if I want to use the same rules for both incoming and outgoing emails, eg. to track communications for a particular project? Is there a trick so I don’t have to have 2 sets of rules? Thank you! Ok, I guess the age-old solution of cc’ing myself on important email will have to suffice. I recently lost the tagging of categories on all my emails, what a huge headache. To use categories in the first place I created a domain and used Google G Suite to create email accounts then synch everything with their sync app. When my computer crashed and I had to reinstall I lost all the categories on my emails. tried everything but no luck, this is very unfortunate because it took so much time to get my emails organized. I’m running Outlook on a Mac tied to O365. I no longer see calendar invites that are sitting in my Inbox showing up in my calendar view and am missing invitations. Is there a way to color code in the inbox/viewing pane which messages are calendar invites?